Montméja, A. de, 1841- . Journal : Revue photographique des hôpitaux de Paris ; vol. 3. Paris : Adrien Delahaye, 1871. Description : 275-276 p., [1 l. pl.] ; ill.: 1 photo. ; 24.5 cm. Photograph : mounted albumen of a male subject, representing exophthalmia. Photographer : A. de Montméja. Subject : Thyroid — Exophthalmic goiter; Graves' disease. Author caption: "Par le docteur A. de Montméja." Photo caption: "Planche XXXV. — Goître Exophthalmique." There are thousands of papers written on goiter and listed in the surgeon general's catalog. Why the editors included this report of the disorder in the Revue is a mystery. 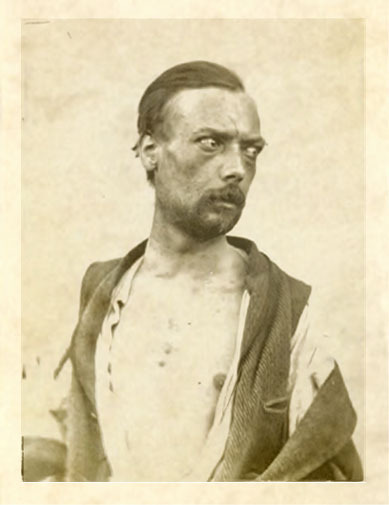 It is probably the first photograph published of the disease, however, and has value as a clinical picture of the male patient when little or no swelling in the neck is present.